Sunny days with a bit of a breeze were ideal for getting the family's clothes washed, dried and put away in appropriate spots during the early 1900s. An outdoor water pump on a covered back porch provided an outdoor room for the washing ritual by the women of some households. Lots of wash materials were gathered together on wash day. Such as a wash stand, a wringer with zinc metal tubs filled with water to rinse the clothes and the proverbial scrub board and scrub brush to use on extremely soiled clothes or linens. An outdoor clothes line was close by for sun drying. It took up a big chunk of time during her day -- the washing, hanging, and folding -- but that was not all she did that day. Some of the other chores she might do were feed the chickens and hogs, weed the kitchen garden, darn socks, bake some bread, prepare breakfast, lunch and dinner, pluck some chickens, can corn relish, dry beans and corn cobs for their seeds, and watch after her children too. Plus more! Whew! The photo above was actually the place where a woman did wash her clothes in the summers of the early twentieth century. The home now stands empty and will be torn down within the coming year according to the present family owners. Upper Silver Creek school. Beautiful aged metal roof. Fresh paint leads me to believe that the school was closed recently? Schools seem especially open to vandalism -- once they have been vacated that is. Soon a beautiful old structure can become target practice for young folks throwing rocks through the windows, graffiti on interior walls, and slogans painted on large surfaces -- in time it sits there degraded and wounded like a homeless person. Where are the caretakers? Do structures that were built with fine design and materials need such insult? Does it not insult the community that used the school? The school I went to in my elementary grades still stands and is still the glowing red brick building I remember. The junior high building that was new when I started seventh grade is now gone. It was bulldozed to make way for development -- apartments. My former high school has grown in size yet is still a centerpiece for my former small, citified community. I do know of several communities that have rehabbed schools for offices, police departments, apartments, community centers, and other useful endeavors. How do some communities make the recycling of old schools work for them while others let the old structures decay and become eyesores? In a nation of plenty, up to now, why is it that we disregard our history, our buildings, our communities, and our environment? Too immense of a question to answer I guess -- so do we continue to just walk away for the most part? I was standing on my porch Sunday night trying to capture a piece of mother nature's light show. It had not started to rain yet so I thought the timing was right to photograph some of the lightning flashes that were constantly filling the sky. I used my camera with the video accessory and started filming. I then stepped inside to see if what I thought I had taken turned out. No, it had not. The flashing light from the lightning was too fast for my camera. My son suggested we take a screen shot of what I had captured and turn it into a still photograph. The photo above is the result. I think this photo tells a story about powerful storms. Just before the lightning flashed -- all was completely black outside. 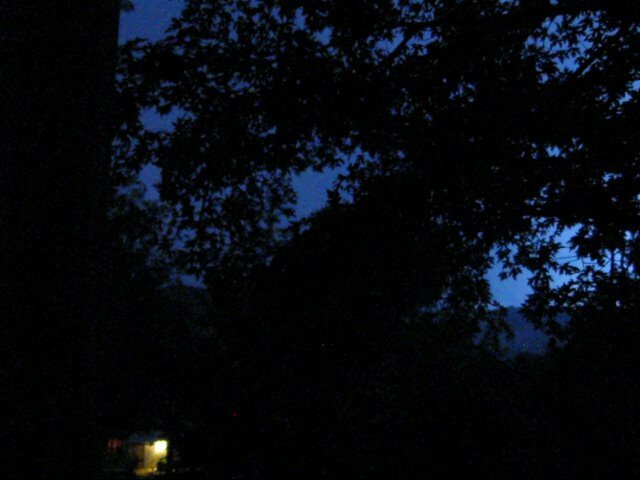 Then a lightning flash occurred -- during which the mountains a mile away could be seen from my porch.The flash only lasted a nano-second but light illuminated all of the southern sky from my viewpoint. Beauty in a volatile stormy sky! I had captured the nano-second, not in a video as I wanted but in a still shot. This was just fine with me -- it is all a learning process. The time was about 10 PM and it was starting to pour. The thunder was close overhead and occasionally making those threatening ripping sounds. I sat back in my comfortable chair - listening , watching, and enjoying the show. This morning a hot sun breaks through my woods shedding bold light on my small back deck. Morning dew has accumulated in large drops on the ends of the pine needles. Last night a magnificent lightning/thunder storm suddenly appeared over my southern ridge, coming in like a race horse and soon disappearing over my back northern ridge. It brought hard rain, ripping thunder and constant flashing lightning. Tried to video some of the spectacular lightning. Did capture some beautiful shows but overall the video was shaky. Won't publish it. Next time I will do better. An old Kentucky 19th century homestead still maintains several of its viable working outbuildings. One of its outbuildings is this small old vertical board shed that's original use is unknown. But today it serves quite nicely as a home gardening shed. It still stands strong upon its original location. 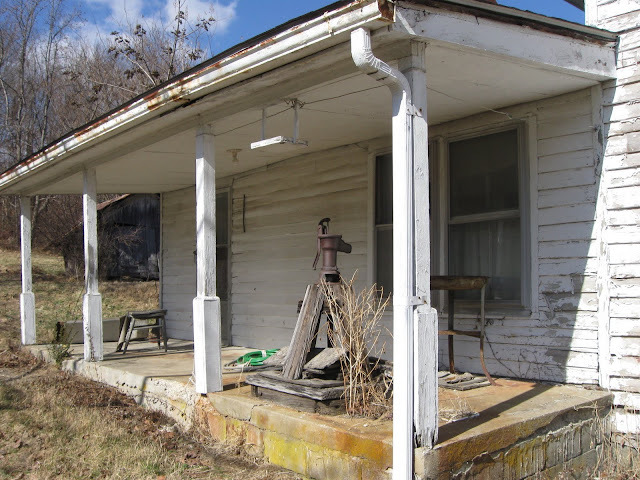 Ideally, one should leave original outbuildings upon their original sites. Old decaying outbuildings could be considered for removal with the owner's permission. Below are a few examples of some that were removed. I have a friend that has an old outhouse that she bought and had delivered to her backyard garden area. She uses it today as a garden shed. Another friend loved the old outbuildings that doted the landscapes in Michigan. She asked her husband to find her one and have it delivered to their property for her birthday. On her birthday she got what she wished for. She drys herbs and flowers and wanted the outbuilding for that purpose only -- sorta her studio to be alone with her interests. I wish that old farms could maintain their outbuildings so they wouldn't fall to decay. However, many times there are either economical or physical reasons why they cannot be kept viable. I feel the next best thing to decline is finding new homes for them where they can be appreciated and folks driving by can have the opportunity to see a little bit of our farm history. If you do remove a building from an old farmstead take photos of its surroundings for historical purposes. Your local historical society would be interested in copies of the photos (and perhaps a history) for their archives. Here is an Appalachian trellis that I saw in a yard this summer -- I figured it would be easy to make. Wood posts and long, twiggy, straight branches are all you need -- these have been debarked but one could leave the bark on. If you have access to woods you could find branches and possibly the posts for this trellis. If you have a difficult time finding posts in the woods, try sawmills or lumber companies. A trellis with a nice simple country look for yards either in small towns or in the country. Or anywhere really. Out my window on a breezy day, as the sun heads down toward the western horizon -- movements of my maple branches bounce dapples of light on my gauzy curtain. I'm spellbound by the moving whiteness -- it has a meditative quality. I sit watching the sunlight dance in sync to nature's sounds heard just outside my open front door. Common Appalachian family home (now vacant) in central Kentucky built early 1900s. Above is an old floor section which resides in a second floor bedroom of an almost two hundred year old log house. Within this section you will notice a tight fitting square patch that has aged similar to the original floor. The elderly owner told me that the patch has been there as long as he can remember -- his home has always been in his family since it was built. I took the photo of the old patch because it reminded me of the saying, " a stitch in time saves nine." The saying means with a little effort up front to fix a problem -- one can prevent problems down the road. I feel life is like that. Yesterday, I was strolling through my farmer's market when I spotted a large water pail filled with tall red crested cockscombs (Celosia cristata). These flowers resemble a large woolly brain -- a "beautiful mind" type -- a look that stops one in their tracks. Of course, I had to buy some. At only $1.50, how could I not. In times past I have grown these red two foot beauties. They're easy to grow from seed. I enjoy them in fresh bouquets and also dry them to either break apart and place in wreaths or just to dangle from a hook in my kitchen or lay in one of my old baskets. Victorians symbolized them as humorous, warm and silly. I would say that I am rather silly at times so we have something in common. October, 1940. Breathitt County, Kentucky. Tis the time for all young folks to parade back to school. There are different types of school choices today -- private, public or home schooling. Notice that none of these choices are the one room school house which used to dot our country's landscape during the latter part of the 19th century and into the earlier part of the 20th century. Primarily rural in nature -- they were located in the country and small towns. I have always appreciated the tradition of the one room school house. I thought it would be interesting to find some old photos of students attending one of these types of schools. Luckily the Library of Congress provided a couple from their archives. 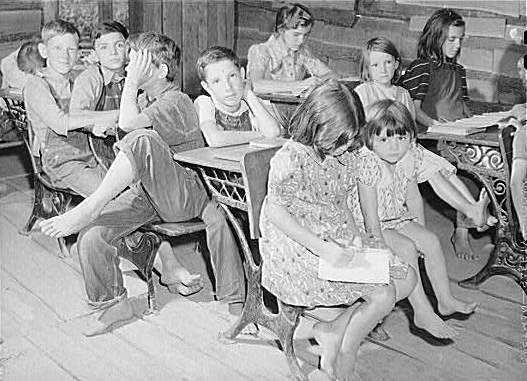 As I am sure you know, the one room school usually held quite a few grades all taught in one room with one teacher. The usual school room scenario seemed to be first through eighth grade. These schools had a traditional social culture where everyone knew each other and you didn't compete by wearing fashionable clothes. Children learned from the students as well as the teacher, and most students assisted those who needed help. 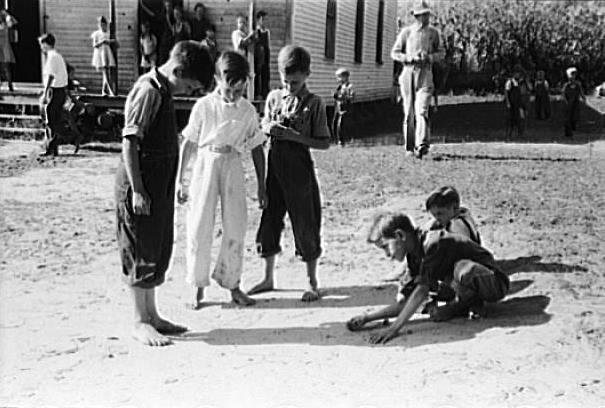 Also, you usually walked quite a distance to school, sometimes brought your homemade lunch in a tin lunch bucket and got time off to help with work chores at home -- these activities would keep children healthy and strong. It was a tight school community onto itself. It was self regulated in a sense. Today young folks are attending large consolidated schools where they do not know all the teachers or other students. The idea of "school community" has become a loosely knit phrase. My question is -- are we going in the right direction with our school culture today? TAILGATE FARMERS GEORGE AND ROY ON THE RIGHT. You hardly see farmers selling their produce along side of the road anymore. But if you know where they are likely to set up you hightail to those spots when you know garden crops have reached maturity. Above are two two Kentucky farmers selling tailgate style along highway 25 by Richmond. Today they are selling fresh picked Silver Queen corn from George's fields. George has been a farmer all his life. Roy was born and raised in Kentucky but moved away with the service and then worked 40 plus years in Indiana. He now lives back in Kentucky. I asked him why he moved back after being away for so many years and he said, " why it's home." and George picked up on that and added, " Kentucky is always in your blood." Together they keep busy as they sell to cars and trucks that stop at their spot. They told me they always sell out of corn each time they set-up -- "why just the other day a dump truck stopped and bought 30 dozen ears from us." I asked them why such a load of corn? They told me they just sell, they don't ask what they are going to do with it. They laughed. Their best sellers are cantaloupe and tomatoes -- they always sell out early with these crops. They sell pumpkins in the fall -- I'm looking forward to that time. I will be checking with them about the pumpkins as they tell me they sell quickly. These two men represent the friendliness of native Kentuckians -- always making you feel comfortable when you are asking lots of questions. I recently did a post on old historic autos. I thought, OK, that was fun to see those old relics -- but I didn't expect to run into another relic quite so soon -- and in a very unexpected place. But, I must say the old truck I found in a very unexpected place was drawing lots of folks. The folks were grocery shoppers in Kroger's produce department. Here sat an old Chevrolet truck that was producing smiles while shoppers lingered looking over all the local produce Kroger's had for sale in its truck and around its wheels. A blackboard was located around the wheel area of the truck which pronounced FARMER'S MARKET. Essentially, they were playing the marketing game of farmer's market only right in their own produce department. I am not giving a plug to Kroger's store (but it can be construed as so). It's just that I thought the management of the store had a clever marketing maneuver going -- it got people talking and laughing to see the old truck posed as if it were participating in a real farmers market.